Meng Hongwei, the Chinese president of Interpol, disappeared after travelling to China in late September. Interpol said organisation rules forbade an investigation into Meng’s disappearance. Meng Hongwei disappeared after travelling to China on September 29. Beijing broke its silence over the matter a week later, on October 7, saying that it had detained him and was investigating him over bribery allegations. ROSLAN RAHMAN/AFP/Getty ImagesMeng vanished after he travelled to China in late September. Sophie Richardson, the organisation’s China director, told Business Insider that “we assume but cannot confirm” that. The international police organisation, where Meng was elected president in 2016, has not provided much clarity either. 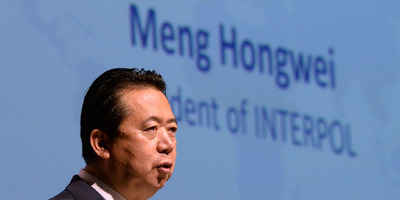 Stock, Interpol’s secretary-general, said on Thursday that the organisation’s rules forbade him from investigating Meng’s disappearance.